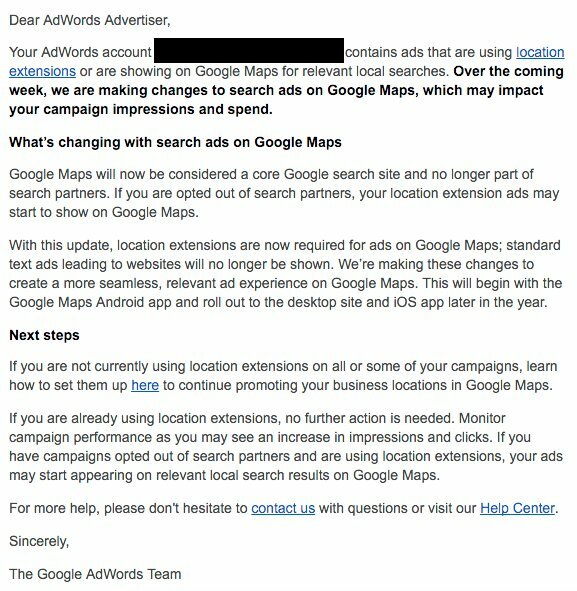 Google sent an email to many of their AdWords advertisers yesterday telling them changes are coming to their search ads on Google Maps. We saw some of those changes yesterday with ads in the local finder results. But more changes are coming. Google said that Google Maps is now considered part of the core Google search site and is no longer a Google search partner. So that means if you opted out of search partners, your location extension ads may start showing up on Google Maps automatically. It also means that you need to have location extensions for your ads to show on Google Maps. This is happening now and going to roll out throughout the year Google said.